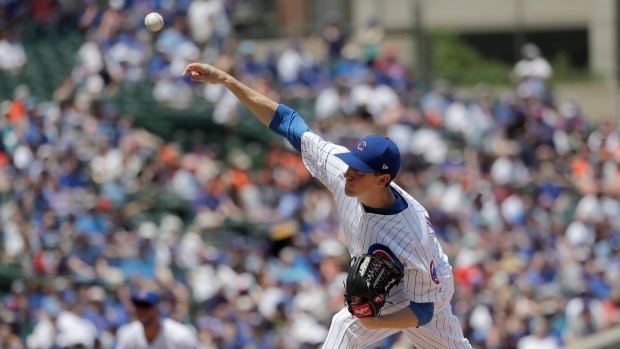 CHICAGO — There isn't much Kyle Hendricks thinks he needs to change. And it's hard to argue when he's in command like this. Hendricks limited San Francisco to one run and two hits over seven innings, Ben Zobrist lined a tiebreaking two-run double in the seventh and the Chicago Cubs beat the Giants 6-2 on Friday. Hendricks (4-3) struck out seven and walked two, helping Cubs open the series on a winning note after a two-game sweep by Cleveland at Wrigley Field. "I feel really good," he said. "It's just that constant focus, come in every day. There are a few things that aren't necessarily where I want it to be right now, but overall, it's been really good." Gorkys Hernandez homered leading off the fourth and singled in the sixth. Andrew McCutchen, Buster Posey and Brandon Belt each hit fly balls to the warning track against Hendricks. But San Francisco managed just four hits and fell to 0-3 on an eight-game trip. The Giants have been outscored 21-5. "It was Kyle's day," Chicago manager Joe Maddon said. "He gave us a chance to win that game." Outscored 11-1 in the Cleveland series, the Cubs chased Derek Holland in a four-run seventh. Zobrist broke a 1-1 tie with his double to left against Will Smith, and Kris Bryant added a two-run single off Cory Gearrin. Addison Russell made it 6-1 with an RBI single in the eighth, and the Cubs hung on for the victory. Pedro Strop retired the first two batters in the ninth before Belt singled, went to second on indifference and scored on Longoria's single. Holland (2-6) gave up three runs (two earned) and five hits. He matched Hendricks before hitting Javier Baez and walking Ian Happ to start the seventh, triggering the Cubs' big inning. Addison Russell moved the runners up with a sacrifice against Smith before Tommy La Stella — batting for Hendricks — walked. That loaded the bases for Zobrist, who lined a double to left. Bryant's single was the only other hit in the inning, and the Cubs drew two walks in addition to a hit batter while sending nine to the plate. "We just talked about a few things," Giants manager Bruce Bochy said. "The thing that has hurt us are these walks. That's what came back to get us today. It's an area where we need to get better." The Giants activated Williamson from the 10-day disabled list and sent left-hander Josh Osich to Triple-A Sacramento. Williamson had been sidelined since April 24 because of a concussion. He was hurt when he stumbled on a bullpen mound and crashed into the left-field wall chasing a fly ball during a home game. Osich has an 8.25 ERA in 12 relief appearances.